The font is doing crazy things again today. It was fine before I hit "publish" but did not post correctly. I have fixed it several times but to no avail. I am going to revert to draft and try it again. I hope it works but if not, I am sorry. Thank you for the nice comments on Tuesday's post. I am very thankful if something I write rings true and it is nice of you to let me know. May God help us all to keep pressing toward the prize AND to never quit! 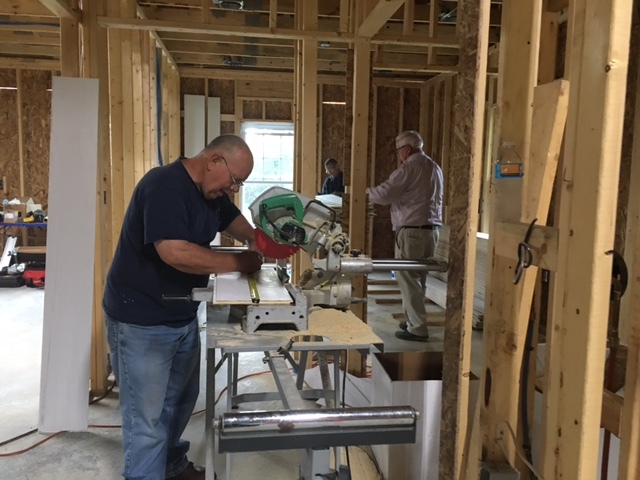 We are supposed to be gone singing and preaching this weekend so we are putting in some long days trying to have the house caught up to where it needs to be. We have insulation coming Monday so the ceilings need to be in place. 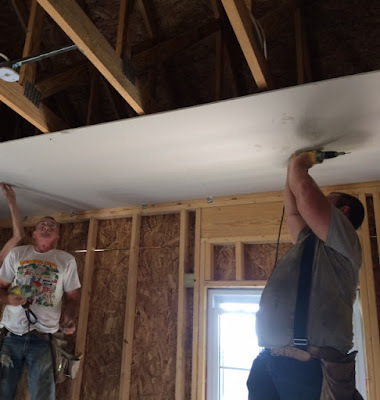 We had sheetrock hangers here yesterday evening doing the flat ceilings. They are about half finished and should complete that in a few hours today or tomorrow, depending on when they can swing by. Wow! It is starting to look like a house now. I have been high and lifted up the last few days working on the ceiling. Here is Odie from my vantage point. 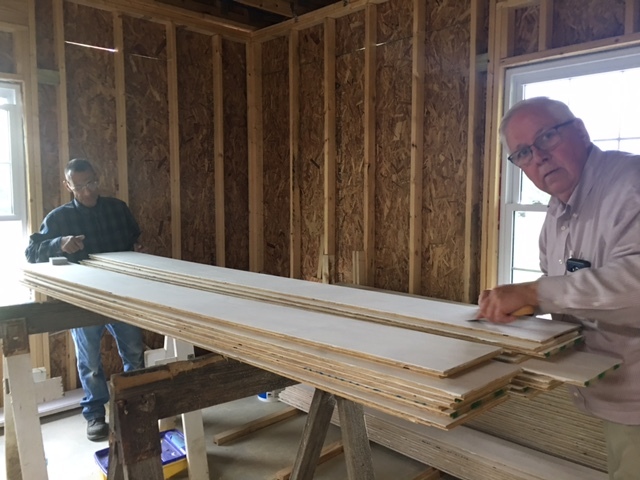 We are putting a wood ceiling in the living room/kitchen area and we have put a lot of hours into that the last two weeks. It is very labor intensive and a few of the days have been extremely hot and humid in the house. 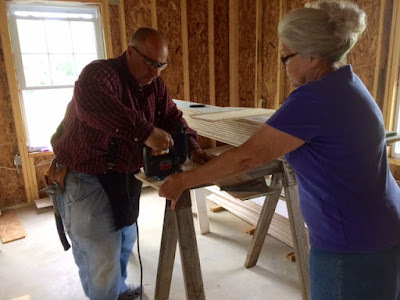 My parents have been working very, very hard to help us. I thought they were going to melt down yesterday. Kelly Jo has been working hard as always. I need to send KJ and my parents on a long vacation when this is over. I think I heard them all say "Amen!" Also, Pastor Wade Hicks and Bro. Don Bragg put in a long day on the ceiling Tuesday. I appreciate all of this good help from family and friends. The work this week is time critical and I could not have done it without them. Others have jumped in to help with the ceiling or to help clean up, including my niece Deidre and my cousin Lisa. Thank you both very much. I will post more pictures of the ceiling process at a later time.We are leaving at dark thirty tomorrow and we have many more things to do before then. We must be off to work.